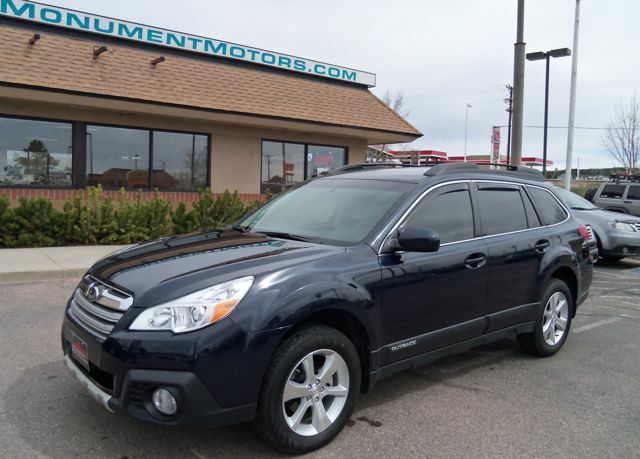 2014 Outback 2.5i Limited Edition at Monument Motors, your source for used Subaru Outbacks near Colorado Springs, Castle Rock & Denver. No Hail Damage. Two owner vehicle. * Fully loaded Outback 2.5i Limited Edition with automatic transmission with paddle shifters, EYESIGHT Driver Assist System ( Pre-Collision Braking & Throttle Management, Lane Departure & Sway Warning, and Adaptive Cruise Control), Factory NAVIGATION, Power Moonroof, Back-Up Camera, heated tan Leather seats, heated mirrors & windshield, VDC stability control, Traction Control, frontal airbags, side-impact & side-curtain airbags, Bluetooth, premium Harman/Kardon am/fm/satellite/MP3/WMA HD stereo with CD player & subwoofer/amplifier, auxiliary jack & USB port, 17″ alloy wheels with locks, premium Cooper tires, remote keyless entry, alarm, dual-zone climate control, power seats with memory, rear seat recline, auto-dimming mirror with HomeLink, woodgrain accents, cabin air filtration, rear privacy glass, rubber floor mats, fog lights, splash guards, side body moldings, cargo tray, rear bumper cover, roof rack with retractable crossbars, and receiver hitch for bike rack, etc. (The original Factory MSRP on this Outback 2.5i Limited was approximately $34,000.) This Subaru qualifies for a 5year or +100,000mile Extended Service Plan at an additional cost. Sample picture. JUST SERVICED AND NEW: engine oil & filter, air filter and cabin air filter. The head gaskets & valve cover gaskets are dry, and no oil or coolant leaks. This newer design 2.5liter boxer engine has a timing chain, so no timing belt to change.